Jason Aldean will team up with Kelly Clarkson to perform their No. 1 hit “Don’t You Wanna Stay” on Fox’s American Idol tomorrow (4/14) 7 pm CT. Later in the evening, Aldean will perform his new single “Dirt Road Anthem” on The Late Late Show With Craig Ferguson on CBS. “Don’t You Wanna Stay” has now been certified platinum for digital sales over one million. Aldean’s massive My Kinda Party tour has been extended through August, and heads to the Northeast for a handful of dates at the end of April. See his website for full tour itinerary. Aldean headlined Country Thunder in Florence, AZ last Friday (4/8). 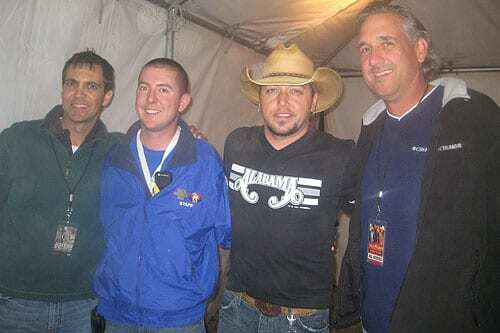 Pictured (L to R): Broken Bow's Jim Malito, KMLE’s Drew Bland, Jason Aldean, KMLE’s Jeff Garrison.